My daughter loves playing with any modeling compound. 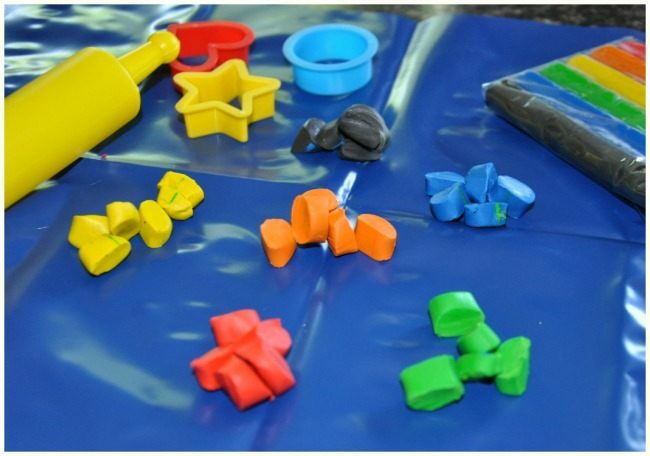 We have many art and craft projects using modelling compounds. Play dough is her most favorite. The only problem I’ve had is we can never save the little figurines the hands craft. So I turned to Modelling Clay. 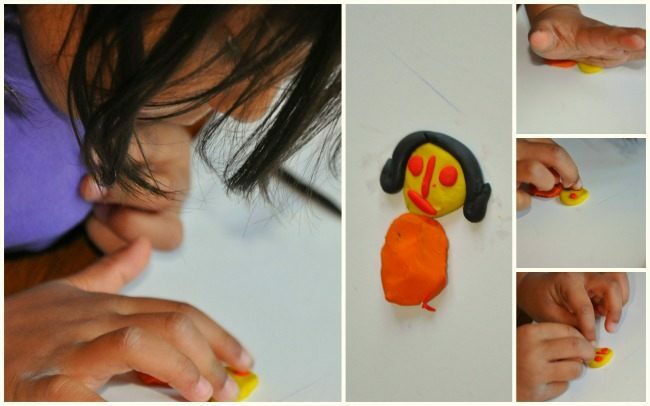 Modelling Clay holds its shape very well and it is soft and pliable and it was the perfect choice to create and cherish the memories of the first crafting days. I would also recommend Model Magic for something like this. It’s definitely a bit more expensive than clay but if you have some on hand sure enough go for it. So, yes, I took the easy route and bought clay. If you want to try making your own clay, here’s a recipe that we use. I must add that the clay we bought was non drying clay, means it will always have wetness to it. It is more pliable and easy to work with. It is different from the other pottery clay or air dry clay. Now, back to our project, we set up a crafting station. When working with clay I highly recommend that you use small amounts and work in batches. This helps to keep the clay from drying up and saving you money. Clay is tougher than play dough so rolling it to make shapes is a good workout on the motor skills. That said we used some fine motor skills to pinch balls of clay and roll it and squish it to make petals and leaves. We made butterflies and clouds and sun and flowers. 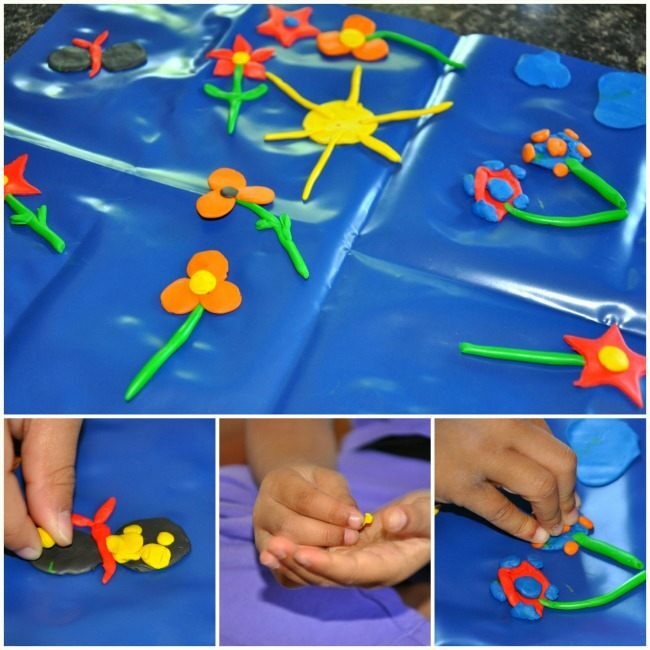 We used the small shape cutters to create our beautiful garden scene. The play also involved a lot of discussions as to what you see in Spring & Summer. The kids know spring is in the air when they don’t need to wear those hefty jackets and layers and layers of clothing. 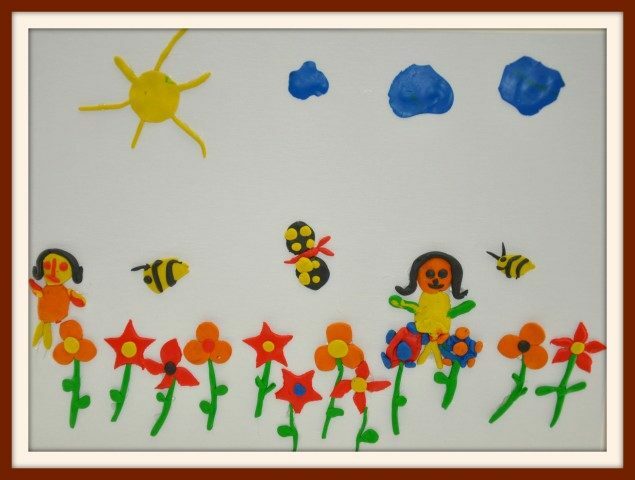 The birds and the bees are springs first visitors and we decided to incorporate them into our craft. Needless to say that spring and Summer bring a lot out outdoor play time and outdoor fun. So she made two figurines, Big S & Lil’ S who love to play outside in our garden with all the spring/summer blooms. So when does this craft meet the art? Once we finished making our flowers, bees and little people it was too cute to just sit and after days get crumbled. I picked out a 11×14 canvas and turned this into an Art piece, one that my daughter can always look at and enjoy her work. So i picked up my glue gun and all the clay crafting and started to glue and put the pieces together. 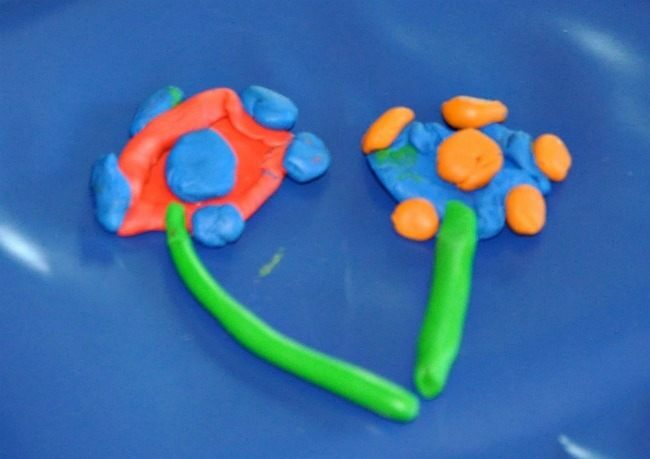 Look at these pretty flowers we crafted from clay. Simple isn’t it? The look on her face when I put it in a frame hung it; She was brimming with joy and pride, not to mention the big boost in her confidence, looking at her own masterpiece – PRICELESS. We have done many Art projects here in the past and we are adding one more to our favorite collection. Hope you like it and be sure to give it a try.